Today, the Founder of Peace and National Unity – Leader of the Nation, President of the Republic of Tajikistan Emomali Rahmon arrived in Roghun city to attend the commissioning ceremony of the first hydro unit of the Roghun hydropower plant. 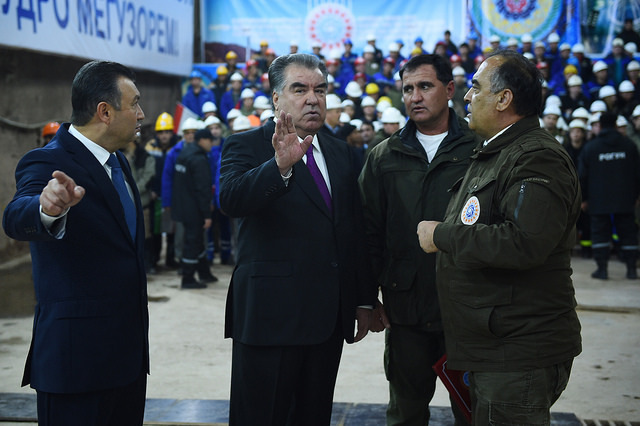 The Leader of the Nation Emomali Rahmon was greeted with special warmth and sincerity at the temporary airport of Roghun’s construction site by the Prime Minister of the country Qohir Rasulzoda. The representatives of Russia, Italy, India, Pakistan, Afghanistan, Belarus, Ukraine, Uzbekistan, Kazakhstan, and Kyrgyzstan as well as leading experts of regional and international organizations were invited to Tajikistan to participate in this historic event. The opening ceremony of the first hydro unit of this biggest hydropower facility runs through the news of the world media. The solemn opening ceremony of the first unit of “Roghun” hydropower plant is broadcasted live on all state TV and radio channels of Tajikistan. Two hundred local and foreign media staff and journalists reported on this important event, including influential international news agencies from the USA, Italy, Germany, Russia, Japan, Great Britain, China, Pakistan, and Kazakhstan, Kyrgyzstan, Uzbekistan and other countries. The Leader of the Nation Emomali Rahmon, by pressing the button put into operation a 500kV power transmission line, thereby fulfilling the long-standing aspiration of the Tajik people. Total amount of 650 TJS was allocated for the construction of the 500kV power transmission line, which was implemented in the framework of the restoration and construction of 500kV high-voltage transmission line through Districts of Republican Subordination (DRS) Project. The project has started in September 2017 and should be completed within specified deadlines, i.e. August 2021. Then, the Founder of Peace and National Unity – Leader of the Nation, President of the Republic of Tajikistan Emomali Rahmon launched the gas-insulated high-voltage switchgear (GIS) for the Roghun hydropower plant. Installation of Gas Insulated Switchgear (GIS) was completed on February 2018 at a high quality level with the participation of local experienced specialists. There are 19 units of 500kV GIS and 4 units of 220kV GIS installed at this site. Energy can be transferred by integrated energy grid of the country through six 500 kV overhead transmission line. In addition, from this equipment the electricity will be transferred to the Roghun city power substation by one two-chain 220kV line. Germany-based Siemens AG has equipped the GIS for the Roghun hydropower plant. Namely, from this hall the electricity generated at the “Roghun” HPP will be supplied to the power transmission lines by means of equipment produced by reputable world companies. 57 units of 500kV poles of gas-insulated switches, 99 transformers, 30 extension modules, 168 units of distributors, 48 voltage transformers, 30 units of 500 kV voltage limiters are installed inside the building of the complete gas-insulated switchgears. Along with the 36th poles, medium power transmission modules are installed. All 500 kV poles are equipped with protective metal structures. On 16 November 2018 a momentous event has taken place in the history of the statehood of independent Tajikistan that has made a significant contribution to achieve energy independence. The Founder of Peace and National Unity – Leader of the Nation, President of the Republic of Tajikistan Emomali Rahmon in a solemn ceremony has launched the first hydro unit of “Roghun” Hydro Power Plant and gave a start to operation of this magnificent project of the century that will contribute to the development of the country. 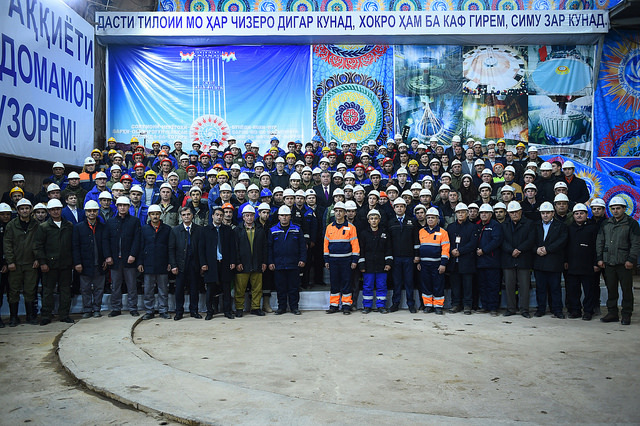 Construction workers, activists and intellectuals, young people, elders, heads and staff of Dushanbe – based diplomatic missions, as well as representatives of international organizations have attended the launching ceremony of the first hydro unit of “Roghun” Hydro Power Plant. After being launched the first hydro unit of “Roghun” HPP will be connected to an integrated energy grid of the country. Now the light and heat of the palace of light of Tajikistan – “Roghun” has entered the houses of people of Tajikistan. Glorious people of Tajikistan were eagerly waiting for this day. 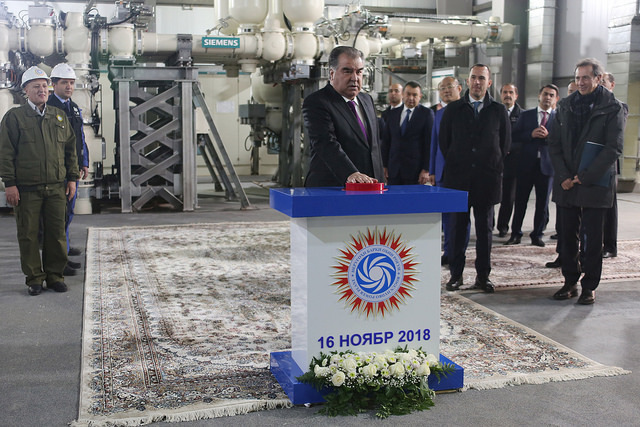 In the machine room, the President of the country Emomali Rahmon, in honor of this historic event – the commissioning of the first unit of the Roghun Hydroelectric Power Plant, left an autograph in the book “Rogun – Palace of Light”. 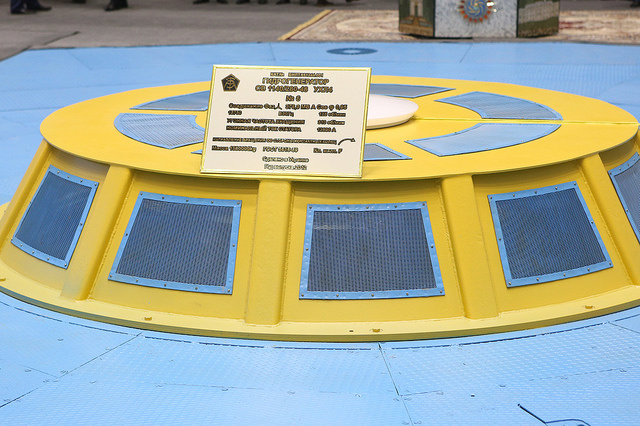 The accuracy of the running unit of the Roghun HPP was determined by the laying of a coin, and thus the operation of the first unit of the station was found to meet the requirements. It has to be mentioned, that on 29 October 2016 construction of “Roghun” dam was officially launched by Leader of the Nation Emomali Rahmon. That day the President of the country has taken the wheel of bulldozer and blocked the flow of Vakhsh River and hence, has launched construction of the dam of this hydropower station. “Roghun” HPP has the biggest capacity out of the hydropower facilities on the Vakhsh River and comprises 6 aggregates with energy capacity of 600 MW for each. “Roghun” HPP with energy capacity of 3600 MW (more than 17 billion kWh) will be the biggest hydropower station in the region. This number is 1,5 times higher compared to the existing capacity of “Norak” HPP. “Roghun” was named by Leader of the country as the matter of life and death of the people of Tajikistan. The launch of the hydropower station is landmark event in the history of statehood of the Tajik nation and will be written into the history of our nation with golden letters. Environmentally-friendly energy produced by HPP will cover the energy needs of Tajikistan and give a new impetus to the economic development of the country. Today the first hydro unit was launched. Other aggregates of the HPP will start their operation next year owing to an iron will of the construction workers. 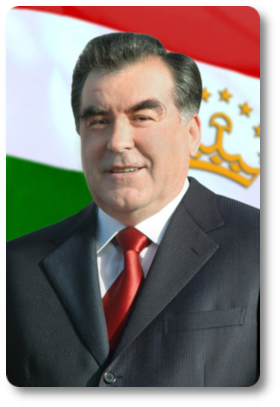 The Founder of Peace and National Unity – Leader of the Nation, President of the Republic of Tajikistan Emomali Rahmon with his far-sighted and humanitarian policy always takes care of the people of the country. 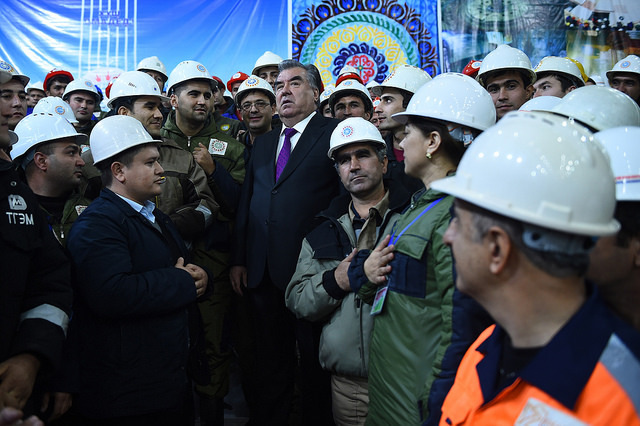 Each visit of the President to the construction site has been raising the spirit of the workers and everyone could observe that they have been carrying out the orders and sermons of the President Emomali Rahmon to perform their work with a particular emphasis on a quality. More than 25 thousands constructors and engineers and other technical staff have remarkably contributed to the construction of the hydropower station. Engineers are committed to continue to launch other aggregates of hydropower station. Building and restoration of this vital strategic construction will serve to ensure decent life of present and future generations of Tajikistan. It will provide a solid ground for economic progress and generally for the improvement of all spheres of life in the country. After starting full exploitation of the HPP it will enable to establish dozens of small and medium factories as well as create thousands of new jobs. Over the years of independence with the view to accomplish plans and programs of the Government of the Republic of Tajikistan aimed at achieving energy independence, as well as realizing noble ideas and objectives of the Head of state to ensure the decent life for the people of Tajikistan, based on order of President Emomali Rahmon on effective hydropower resources management, the country began construction of hydropower stations and high-voltage power transmission lines. 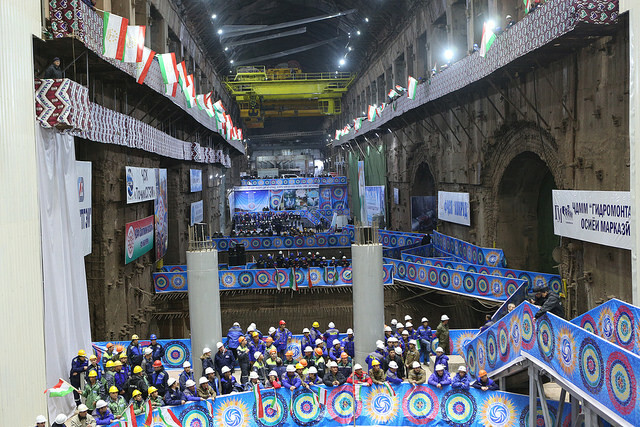 The start of the restoration and construction of “Roghun” HPP, rebuilding of “Norak”, “Sarband”, “Qairoqqum” HPPs, the launch of “Sangtuda-1”, “Sangtuda-2”, “Pomir-1” , “Tojikiston” HPPs at an altitude of 3500 meters above the sea level in remote area of Murghob, Thermal Power Plant “Dushanbe 2”, electric substations “Dushanbe” and “Sughd” with a capacity of 500 KW, power transmission lines South-North, electric and gas insulated switchgear (GIS) with a capacity of 200 and 500 KW within “Norak” HPP, substations “Lolazor”, “Khatlon”, “Ayni”, “Shahriston”, “Shahrinav”, “Geran-2” with a capacity of 200 KW, power transmission lines with a capacity of 200 KW “Lolazor-Khatlon”, “Tajikistan-Afghanistan”, “Khujand-Ayni”, “Qayroqqum-Sughd”, “Ayni-Rudaki”, as well as commencement of an implementation of CASA-100 Project have been among the noticeable achievements Tajikistan has made on the way towards energy independence and have been implemented under the provident policy of Leader of the Nation. Upon an implementation of these projects during the past 10 years the energy system of the country has increased by 1320 MW and more than 1300 kilometers of power transmission lines with a capacity of 220, 500 and 110 KW have been built. 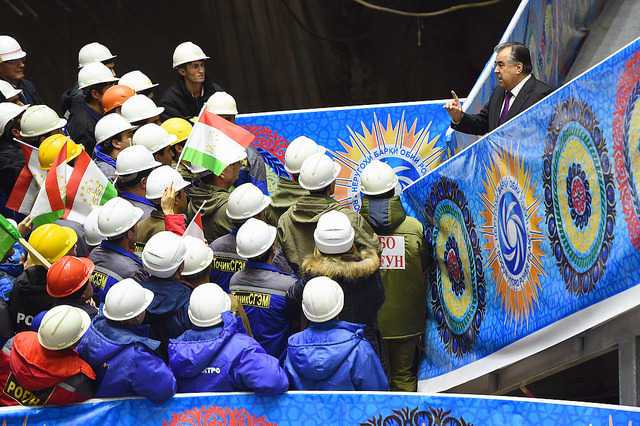 After launching the first unit of the “Rogun” HPP, the Founder of Peace and National Unity – Leader of the Nation, President of the Republic of Tajikistan Emomali Rahmon made speech at the dam construction site before the large number of people who gathered for the launch ceremony of the first unit. 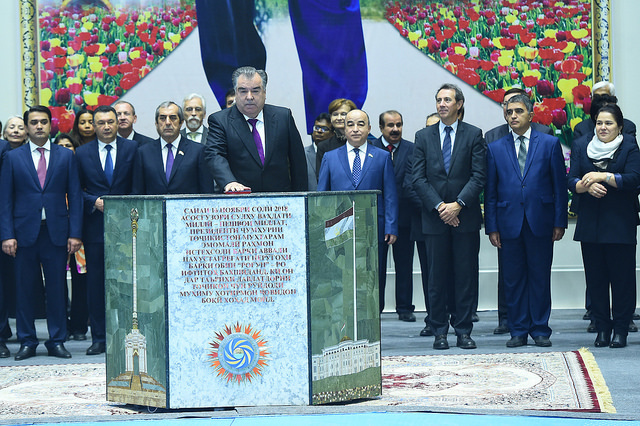 President Emomali Rahmon congratulated all residents of the country and foreign compatriots on this important event. The head of state, on behalf of the entire Tajik people, on his own behalf and the Government, expressed sincere gratitude to the builders and workers of this grandiose temple of light, who showed courage, heroism and a sense of patriotism in this creative labor field, people’s arena of valor and honor. It was noted that since the first days of independence the Government of the country in order to ensure the necessary conditions for sustainable development has directed all resources and available opportunities to the construction of power plants. The leadership of state and Government deeply realized that the “Roghun” HPP is the most important factor in the socio-economic development of the country, ensuring a decent life for the people, that is, the prosperous future of our beloved Tajikistan. Construction and installation works at the “Rogun” HPP are carried out with the involvement of 70 organizations and institutions, well-known domestic and foreign contractors, 22 thousand specialists and workers, more than 90% of whom are citizens of Tajikistan, as well as using 3,600 machines and mechanisms. The head of state emphasized that along with the commissioning of the first unit of the “Roghun” HPP and the production of first electricity, which we have now witnessed this historic event, many works on other major and auxiliary facilities have been completed to date. In particular, a 500 kV “Dushanbe – Roghun” transmission line has been built and commissioned. Today and in the future, “Roghun” HPP will be the subject of high pride of every citizen of our beloved Homeland, a source of inspiration, and patriotic feelings of the glorious Tajik people. In conclusion, the President of the country Emomali Rahmon once again sincerely and wholeheartedly congratulated all the glorious people of independent Tajikistan with the first ray and the first spark given to us by this grandiose palace of light of the nation. The World Bank Regional Vice President for Europe and Central Asia Cyril Muller, and the Deputy Minister of Foreign Affairs and International Cooperation of Italian Republic Manlio di Stefano made speeches at the solemn ceremony in honor of the commissioning of the first unit of the “Roghun” HPP. It should be noted with confidence that with the launch of the first hydro unit of the Roghun HPP, the population of the country will be provided with electricity at all times of the year, and the activity of industrial production enterprises in cities and regions of the country will receive a new impetus, and production capacity of sovereign Tajikistan will further increase in the direction of production of competitive and targeted products for export. According to international experts, the initiative of the Head of the Tajik state in rebuilding of the Rogun Hydropower Plant is the result of a moral achievement, the unique talent of governing the country, endless love for the Motherland and the people, unremitting efforts to ensure a decent life for the people. This initiative will not only provide the country’s energy independence and give an unprecedented impetus to the development of the national economy, but also provide a new quality and content to the life-affirming national idea of the unity of the people of Tajikistan. Indeed, the Roghun HPP will illuminate our homes and hearts with light and warmth, the new hydroelectric power stations will be built on the rivers of country, vast energy resources and creative efforts of the people under the wise guidance of the Founder of Peace and National Unity – Leader of the Nation, President of the Republic of Tajikistan Emomali Rahmon, makes Tajikistan more beautiful and comfortable, and thanks to this grandiose facility, the Tajik people will stand on a par with the peoples of the advanced and developed countries of the world.